With the sun residing in the constellation Aquarius, or Kumbha, the full moon falls on the sign exactly opposite, in Leo or Simha. This year it is on the 11th and the 12th of March. In the Tamil Festival calendar the full moon in the nakshatra Magha, part of Leo/Simha is a great festival. 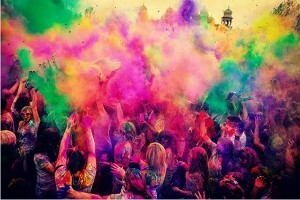 In North India this opposition is the time of the great festival of Holi. Maasi Magha, the moon residing in the nakshatra Magha in the month of Kumbha/Aquarius, sees the gods of temples brought to the nearest sea shore, river or sacred lake. Many myths are told about its significance. 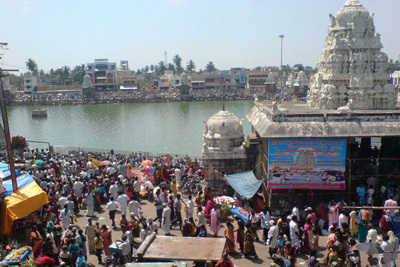 In the sacred city of Chidambaram it is celebrated that the god Varuna, who is the primordial Ocean,was liberated from a great sin. Varuna had accidentally killed Brahmin during a 100 year battle. The waters of the Ocean were so upset by this, they dried up completely and all rain on the earth had stopped. Now all the Gods gathered in the Great Hall in Chidambaram, where Lord Nataraja performs his Cosmic Dance, the Ananda Tandava. And prayed for the release of the Waters. The Dancing Lord sned them all to gather ate the sea shore, to take bath with the full moon in the star Magha, in the Aquarius Month. Thus the festival of Maasi Magha was initiated. 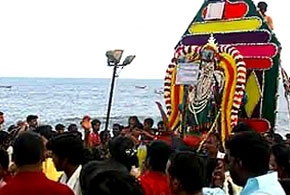 The Waters returned, the sea returned to its shore, and Varuna was released from the sin of murder. All bathed and made merry. So on this day the celestials descend to earth from heaven and are offered the sacred bath. It is a day also that the amritam, the elixer of immortality, manifests in the waters on earth. Especially in Kumbhakonam, in the Mahamagha pond. All who bath on this day are released from their sins. In northern parts of India the full moon in Leo/Simha is the time of Holi, the spring festival, when it is celebrated that life overcomes death, and good wins from evil. The evening before the full moon a great bonfire is lit, and the next day people make merry with spraying oneanother with colored water and colored powder. 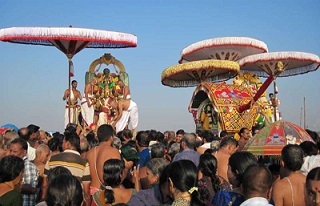 The myth behind this celebration tells of the Asura Hiranyakashipu and his son Prahlada. Hiranyakashipu was the king of the Asuras, and his devotion had earning him a great boon. He could not be killed by either a human being or an animal, not indoors or outside, not by day nor by night, not by an astra (projectile weapon) or by a shastra (handheld weapon), and neither on land nor in water or air. After earning this boon Hiranyakashipu grew arrogant, thought he was God, and demanded that everyone worship only him. All threw themselves at his feet, except his son Prahlada. He dedicated his devotion to the supreme Vishnu. Hiranyakashipu tortured his son endlessly. Finally, Holika, Prahlada’s evil aunt, tricked him into sitting on a pyre with her. Holika was wearing a cloak that made her immune to injury from fire, while Prahlada was not. As the fire roared, the cloak flew from Holika and encased Prahlada, who survived while Holika burned. At last Hiranyakashipu challenged Prahlada, “where is your god?” Then Vishnu, the god who appears as an avatar to restore Dharma in Hindu beliefs, took the form of Narasimha – half human and half lion, at dusk (when it was neither day nor night), took Hiranyakashyapu at a doorstep (which was neither indoors nor outdoors), placed him on his lap (which was neither land, water nor air), and then killed the king with his lion claws (which were neither a hand held weapon nor a launched weapon). Nice information, I liked it.